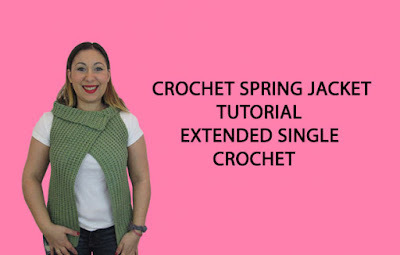 How to crochet a jacket for spring with extended single crochet! Row 1: 1sc into the 2nd chain from hook, 1ex sc in each chain across. Row 31: chain 1, turn, 1sc into the 1st, 1ex sc in each stitch across until 30 stitches remains. Let the last 30 stitches unworked. Row 35: chain 1, turn, 1sc into the 1st, 1ex sc in each stitch across until 30 stitches remains, chain 18, skip 18 sitches, 1sc into the next, 1ex sc in each stitch across until the end. Row 36: chain 1, turn, 1sc into the 1st, 1ex sc in each stitch across until the chain, 1ex sc in each chain and in each stitch across until the end. Watch my video tutorial witch shows you how to make this beautiful jacket step by step!